When ordering your society team package through NSE you can elect to add the SpecialEffect badge to it as well. This will make the design £2 cheaper for you and we will donate £2 to SpecialEffect, a win-win! After the design is complete and uploaded to the NSE store, your society members will have the option to include the SpecialEffect badge to the printed product, again making the jersey £2 cheaper, with another £2 being donated to SpecialEffect. 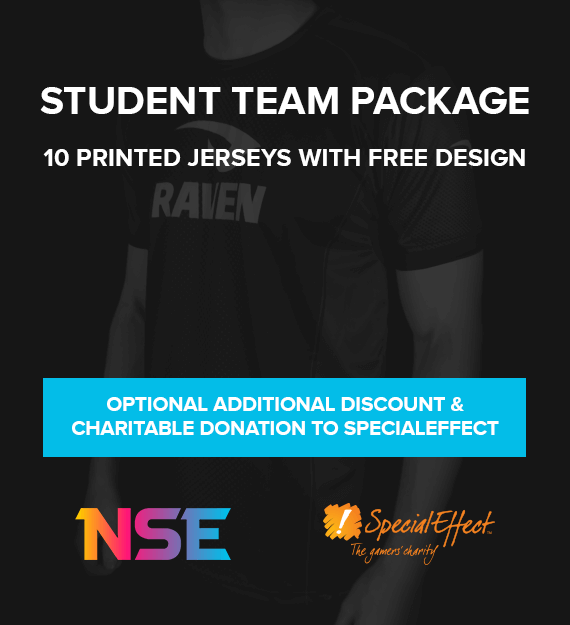 The ‘Student Team Package’ consists of 10 printed jerseys at a discounted rate along with a free jersey design, a exclusive package for university societies. After purchasing a Raven representative will be in touch to begin the project with you. Manufacturing time is approximately 3 weeks.